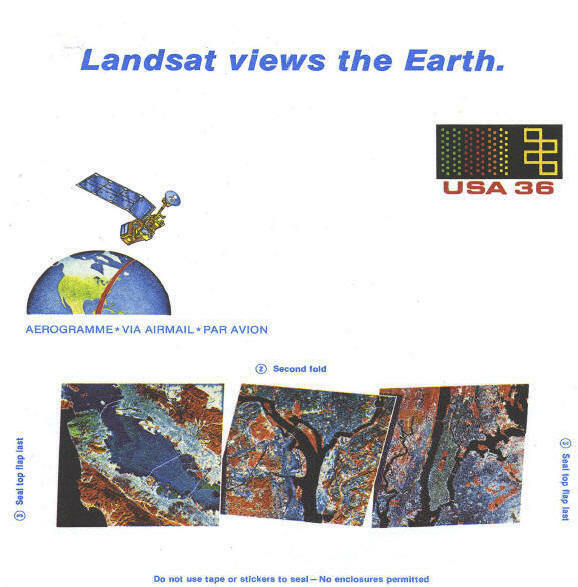 "Landsat" refers to land survey by satellites. On this piece of aerogramme images of San Francisco, Washinton, and New York (left to right) are shown in "false color." The indiciumI the seven bands of data acquired by the high altitude survey. The cachet shows the Landsat tracking the eastern United States on a north-to-south polar orbit. The postal indicia shows the location of satellite tracking stations throughout the world in 1983.